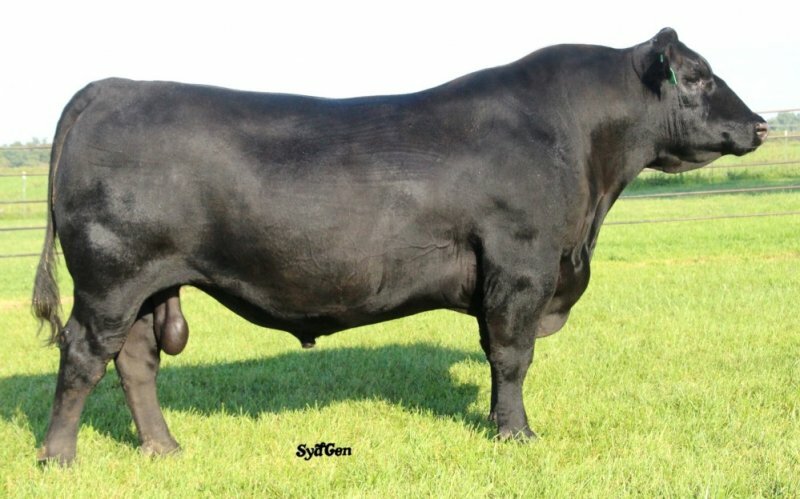 � The record-selling bull of the 64th Annual Baker Angus Farm sale in Missouri, a program that has been producing top performance fescue tolerant Angus cattle for more than six decades, Jack Baker considers this high performer produced as a heifer�s first calf the greatest breeding achievement of his Angus career. � With a moderate actual birth weight of 78 pounds and an adjusted 205 day weight of 795 pounds, his adjusted 365 day weight of 1,704 pounds with a %IMF estimate of 6.61% and an adjusted 365 ultrasound rib eye area measure of 17.7 square inches, this massive and impressive young sire exceled at every point of measure in the beef industry. � Ranking among the top ten options available from ORIgen as of this writing for both $Beef value index and hot Carcass Weight EPD, this top 1% young sire for $Weaned calf value index is among the breed�s elite for Weaning Weight EPD, Yearling Weight EPD, Scrotal Circumference EPD, maternal Milk EPD and $Feedlot value index to make him a sire that can be used for multiple purposes at the same time.